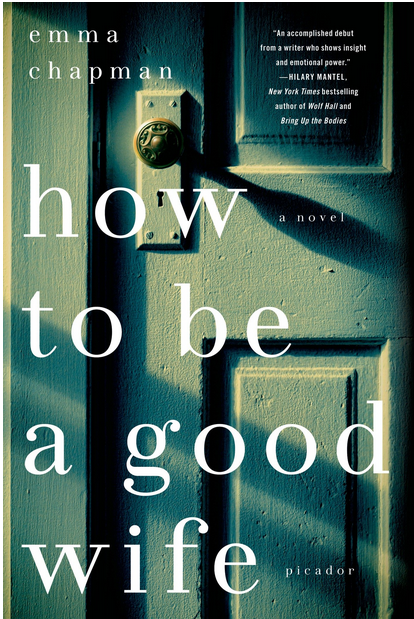 The title of the book How to be a Good Wife by Emma Chapman comes from a book that Marta, the main character, was given by her mother-in-law upon her marriage. Marta is a troubled and troublesome woman, highly strung and difficult to get along with. Her behavior has been kept in check by an unnamed "medication" that her husband Hector administers to her regularly. Lately, however, Marta has been spitting out the tablets when Hector isn't looking, and the result is that she is transformed from the previously docile and compliant "good wife" into a woman who experiences hallucinations and exhibits unusual behavior. Marta and Hector have been married for many years and live in an unnamed country (although the clues seem to point to Norway -- lots of mentions of fjords). Marta is in her early 40s, and Hector is 20 years older. They have one child, a son named Kylan who has recently moved out and plans to marry is live-in girlfriend, Katya. The thought of her son leaving home (and being permanently left alone with her husband) fills Marta with a sense of panic, even though Hector seems to be nothing but kind and considerate of his wife's wild mood swings and unpredictable behavior. When questioned about how they met, Marta can't remember but Hector tells the story of how he saved her from drowning at a holiday beach spot. When he found her, she was malnourished, and her hair was matted. She knew that her parents were dead but nothing else about her past. Since her marriage, she has devoted herself to her family and to being "a good wife." She travels no further than the local village to shop for food and spends most of her days cleaning and preparing meals for her family. Since Marta decided to stop taking her medication, without anyone's knowledge, she has been seeing a young blond girl in and around the house. The girl seems to be in some sort of danger, but Marta has a hard time figuring out where the danger is coming from, especially since the girl vanishes whenever Marta seems to get close to her. Marta's odd behavior isn't going unnoticed by her family, but they only express concern for her well-being. As Marta experiences longer and longer visions of the blond girl, her own memories of the past begin to surface. Is Marta in danger as well? I really enjoyed trying to figure out what was real and what was a figment of Marta's illness as the story progressed. It was somewhat claustrophobic as poor Marta rattled around her house polishing yet another surface while stopping occasionally to observe the blond girl and her predicament. I wish the book had an epilogue to further explore what happened after the events in the book, but since it doesn't, it leaves the reader with a lot to think about!